Weather Modification, Weather Radar Systems - Weather Modification, Inc. Weather Modification, Inc. not only sells and services C-band, X-band, and S-band weather radar systems to clients around the world; we incorporate them into our own cloud seeding projects. Ranging from smaller mobile radar systems, to polarimetric Doppler research quality systems, we can meet radar needs for a wide range of customers. Weather Modification, Inc., owns, operates, and sells new single pol and dual pol radar systems that utilize a solid state transmitters, digital receivers and antenna control systems. Configurable display software allows a wide variety of user-defined product display and analysis features. Available antenna diameters include 3.5 meters, 4.2 meters, and 4.5 meters. Also available are new fiberglass radomes. Antenna/Pedestal -40 to +55 C, 0 - 95% R.H.
C-band weather radar systems with state of the art transmitter and receiver upgrades. TITAN display and analysis software are available for sale or lease. These systems come with an 8-foot antenna dish and a 12-foot fiberglass radome, and can be installed with a tower, or as a mobile unit. 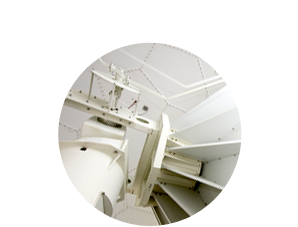 We provide transmitter, receiver and antenna upgrades to nearly any type of C-band weather radar. After an assessment of your existing radar, we can recommend upgrades that allow the most modern equipment for reliability and superior data quality. More about Weather Radar System Upgrades. Includes new solid state power supply and modulators. This system is power-efficient, protected with auto-reset circuitry, and produces a precise pulse. A custom control panel is also available and can be optimized to fit existing equipment. Installation includes modern digital receiver with Doppler functions. This system produces display and analysis products, and also can be interfaced with the TITAN display and analysis system. Our team of experienced radar engineers are ready to help with Weather Radar System issues. From installation to service to upgrades, we guarantee you will be getting the best service possible.